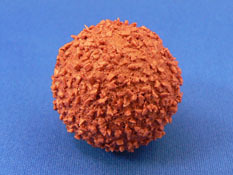 Sponge balls | Showa Rubber Co., Ltd.
Our company carries out in-house production of sponge balls. 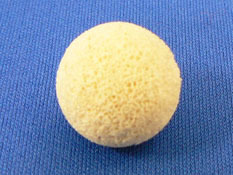 Our company's sponge balls remove any slime, sludge, scale or other contaminants which are formed on the inside surfaces of narrow pipes while the plant continues operating, which improves the heat transfer performance of the pipes while also preventing corrosion that can be caused by these same materials. 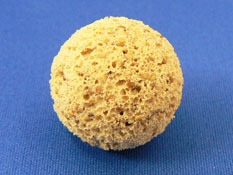 A variety of characteristics are tested in our company's research labs, and strict quality management is carried out on abrasion resistance, sphericity, tear resistance, stability, water absorbing qualities, sedimentation qualities and other properties to ensure uniformity of the sponge balls in order to provide a selection of sponge balls which are optimum for the narrow pipe materials, dimensions and inner surface types. Washing ball for aluminum brass pipes, titanium pipes, etc. Uses natural rubber which has superior abrasion resistance as a raw material and has a slightly higher specific gravity (when submerged) than water so it is pushed along by the water flow. 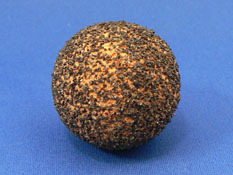 We have a standing supply of general use size standard sponge balls, so time is required for shipping inspections and shipping, but there is a prompt delivery system in place. Abrasive power is increased by adhering hard plastic particles to the surface of the standard ball as abrasives which allows the ball to remove comparatively hard scale that the standard ball cannot remove. Abrasive power is increased by adhering carborundum (silicon carbide) particles to the surface of the standard ball as abrasives which allows the ball to remove hard scale and corrosive materials that even the resin coated ball cannot remove. Has higher cleaning capacity that the standard ball because hard biodegradable botanical material particles are mixed into the main body of the sponge ball to improve abrasive power. The hard biodegradable botanical material particles are broken down by microorganisms in seawater, promoting the breakdown of outflowing balls.